They say you can’t do it: go home again, I mean. It’s a saying I never quite understood. I think it means that memory is flawed and what we remember about safe and familiar places is never what was. And even if what we remember is accurate, we can’t re-create it. One of the most amazing films about memory and nostalgia and home that I’ve ever seen was Terrence Malick’s beautifully filmed and profound work ‘Tree of Life‘ starring Brad Pitt, Sean Penn and Jessica Chastain. It is non-linear and intentionally choppy, much like our actual memories are, and will evoke emotion even where comprehension eludes you. That movie, and my own recent trip home got me thinking lately about how we construct our lives based on what we think we once were; how the people we become are in large part based on our flawed recollections of what used to be. As I write my characters, I find that it’s essential to know who they are, not just in the moment that I’m capturing in my novel but before that, so I spend countless hours thinking about what ‘home’ means to them. Were they happy? Did they have a family that loved them? Was there a mother and father there? A mother and mother? Only a grandmother? All of these questions, once answered, add a dimension to who they are in the time that I meet them. The answers to these questions inform how they will respond to other characters, to challenges, to happiness offered, and to the world around them. What I haven’t yet learned how to do consistently is to imply but not always explain all of these nuances to the reader. You know what I mean: those books that give you pages and pages of back-story that may or may not be interesting, but don’t necessarily move the plot along? Still, there are times when I think it’s important to have characters “go home” either literally or metaphorically. In the novel I’m currently working on, one of the characters makes choices that make her somewhat unsympathetic to the reader and for that, I think it’s key to know what ‘home’ is for her. Only by seeing from whence she came – psychologically as well as literally – can the reader understand and perhaps begin to like her despite her faults. The book, titled ‘Unsuitable Men’ will be out later this year and I’ll be working on meeting the challenge of having just the right balance of the character’s past and their present. 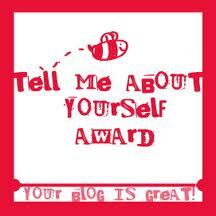 But for now, I’ve been given another challenge: my friend in the blogosphere Mistress M, whose amazing blog can be found here, has recommended me to participate in the Tell Me About Yourself Award, where I must write seven things about myself that I haven’t revealed before, and nominate seven other bloggers for the same award. So I’d better hop to it . . .